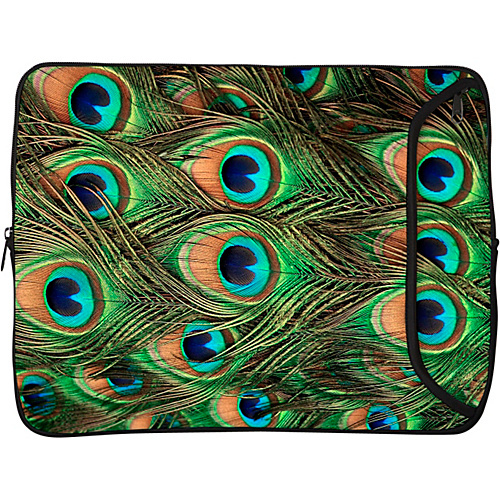 Show off your funky style with the bold and graphic Designer Sleeves 17” Designer Peacock Laptop Sleeve, perfect for students of all ages and for young professionals. Available in several Animal print patterns, this washable designer laptop computer sleeve has thick and durable neoprene padding that cushions your laptop for maximum moisture, shock, and scratch protection, and it slides easily in and out of your backpack, briefcase of luggage. A zippered external pocket provides secure storage for power cords, memory cards or sticks, and other electronic equipment or items you need to get to in a hurry. Make a statement with the Designer Sleeves 17” Designer Laptop Sleeve! Zippered external pocket provides secure storage for power cords, memory and more!